Derailleur Hanger alignment tool ? I'm looking around for an inexpensive but decent Derailleur Hanger alignment tool . The Park Tool one is good but is north of £60 . I wonder if anyone has use any of the other cheaper brands and what they're like ? Also If anyone has a Park Tool one that they want to get rid of ? Re: Derailleur Hanger alignment tool ? Such tool is both a precision and a brute-force thing to be made in one. The key is in the strength of the beam, the play in the pivot and the quality of the threads on the latter. 1- you can always find the spares for Park Took, like a new pivot etc. since you have to sweat up the hills and coast down them. Mine is the Cyclus shown above. Does the job, I think. 2) the pointer is usually rubbish; it needs to both move out of the way (when you swing the tool 180 degrees) and yet retain the setting. Most do neither very well, despite the fact that it would be very easy to incorporate a hinge etc into the pointer. For many years I used a spare wheel with a nutted axle as 'a tool' and this worked just as well. If you install a rear wheel without a cassette (or the wrong way round in the frame) there is usually plenty of clearance for a nut (on the 'tool') on the inside of the hanger and this avoids overloading the screw threads. Currently I also have the choice of using the park tool thing, but I have thrown the pointer in the bin and I have replaced the threaded piece with a different thing that allows me to fit a nut on the inside of the hanger too (as well as adjust the free play in the tool, get extra clearance for oddball frames etc). This means that there is relatively little of the original tool remaining, and it is all the better for it IMHO. I will probably engineer a better pointer at some stage but for now I just use a digital Vernier caliper to measure the clearance to the wheel rim. If you take an average of the two measurements on opposite sides, you will have a nominal measurement to shoot for that gives you zero degrees alignment, i.e. without swinging the tool 180 degrees, which potentially allows faster, more accurate work, with fewer bend repeats . 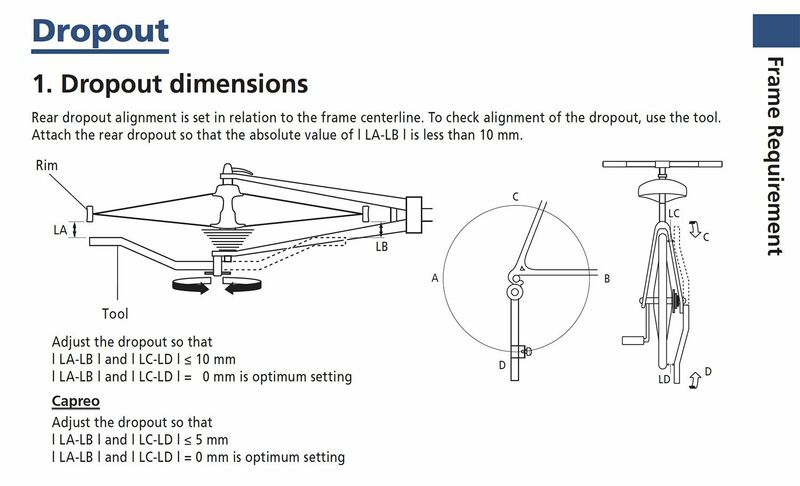 IIRC the shimano specs allow 0 to 0.5degrees 'toe out' and 0 to 0.5degrees 'negative camber' (if you see what I mean). This means that (vs the nominal average measurement on a 700C rim) you can have 0 to 2.7mm 'toe out' and 0 to 2.7mm 'negative camber'. If you are comparing measurements both sides, you are 0.5 degrees out when they differ from one another by 5.4mm. If you are using a tool every day then ease of use and spare parts etc are important. If you are only going to reset a gear hanger once in a blue moon you can get good accuracy without a special tool, you just need a spare wheel with a nutted axle. The fact that it may take a bit longer to use is neither here nor there, however it is at least as important that there is a minimal chance of incurring further damage to a gear hanger. Yes, David Rome is always worth a read. Those tools pictured, the Abbey HAG, the Shimano tool and the $500 EVT model don’t have an inboard nut. Presumably the manufacturers feel they can live with those loads on the screw threads. I suppose a crash that bends the hanger but leaves the mech in a working condition is arguably a good deal worse for the hanger - and that is tolerable. I have the Park Tool DAG2.2. I recognise that it is flawed - there is inherent ‘slop’ in the design - but, realistically, I can’t justify spending further money - or time - on replacing or improving it: it’s better than nowt. Interesting link. The author says to measure @ 6,12&9. I have always done this but also measure @3. BTW, I made my own with an old axle and some square steel tubing. I just use my steel ruler. Woodtourer wrote: Interesting link. The author says to measure @ 6,12&9. I have always done this but also measure @3. If the hanger is aligned at 0 degrees the clearance between the tool and the wheel rim ought to be the same everywhere. As I mentioned above if you take the average of two opposite readings (and the hanger moves close to where the tool screws in) you have an absolute measurement which gives you a 0 degree value, so you can align the hanger accurately in both planes without swinging the tool back and forth endlessly. Since these tools don’t have an inboard nut, I tighten the screw into the hanger fairly hard, probably around 10 Nm. That way pressure is maintained on the side of the face that bears a reduced load during the bending of the hanger. With insufficient screw preload one side of the face would lift off. I haven’t done any calculations, but I’d be surprised if the additional load on the threads while bending the hanger is significant compared to the preload at 10 Nm. I’ve only worked with steel hangers that bent readily. I have the Park Tool too. It works although I could think of others ways of designing such a tool. in which they make it somewhat clearer that 'toe out' alignment is permitted but 'toe in' is not, not to any great extent. They take good alignment in the vertical plane for granted. b) hangers that need straightening are very often damaged hangers; if damaged, the threads may be strong enough to mount a derailleur to, but not strong enough to withstand being used to straighten a steel hanger. if (with a correctly fitted wheel) you carefully set the hanger in the middle of the allowed range, the rim in a badly fitted wheel would have to move by 5mm or so away from the normal position in order to throw the alignment out far enough that you would be almost out of tolerance. In most cases I think you would notice this. Brucey's method using a spare wheel seems to be a good one, and possibly more accurate than a lot of the tools on the market. As an alternative, could a spare hub be used to good effect? a piece of stout 2x2 wood could be drilled with the hub diameter and then cut, so that it could be clamped with a couple of screws to hold it on the barrel of the hub. this would give (if bearings are spot on) a easy to use gauge which could be taken to various positions and measurements taken between it and the wheel rim. If a similar arrangement could be made using aluminium or steel it would potentially be more accurate, but most of us don't have the necessary machinery. Two straight flat bars (approx.150x25x6 or 3) with a 10mm hole in one end and 10mm threaded bar with nuts and washers will do the trick, oh and a bolt that will pass through the drop-out derailleur hole. One bar fastened vertically in the drop out, one bar bolted to the hanger, bend hanger with adjustable spanner until parallel. Repeat in the horizontal position. I'm just back from leading a tour where on three other people's bikes (one because it was bent already, two after crashes!) I straightened gear hangers by the simple expedient of poking an allen key into the derailleur's attachment screw socket and pulling on it until everything looked alright. In each cases it only took two or three pulls to get the mech near enough parallel to the wheel that indexing worked in all gears, which is all that matters. I do have and would much rather use the proper Shimano tool, but it's a bit too big to take on tour! So I thought I'd share the welcome news that when necessary, near enough can actually be good enough! Hint: orient the allen-key of your multi-tool so it's folding axis is aligned with the direction you need to pull. Depending on the size of the multitool, this can give you a reasonably long lever that will not fold up when you pull on it. One lady owner, never raced or jumped.